I was looking for a narrow bookcase to fit in a small space when I saw something really stunning in a furniture store. I loved it, but it was much too big for my space and cost more than I wanted to spend. 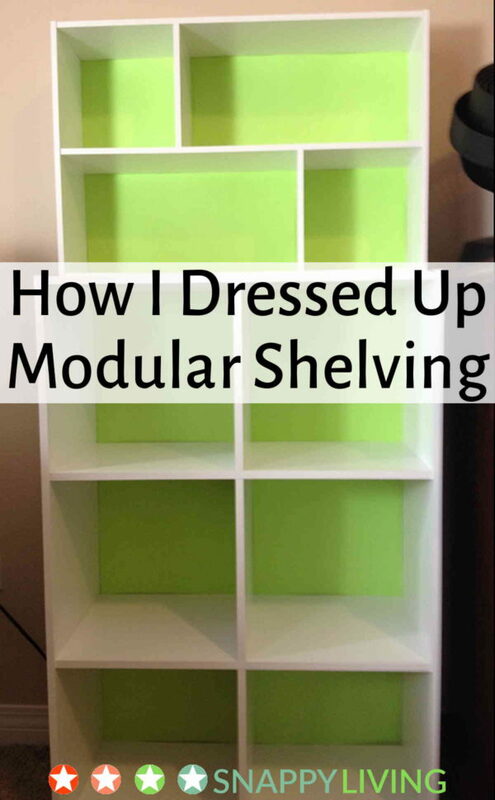 Here’s how I dressed up some modular shelving to give it a similar look. Disappointed, I went to see what they had at Target since some of their furniture can be pretty nice. 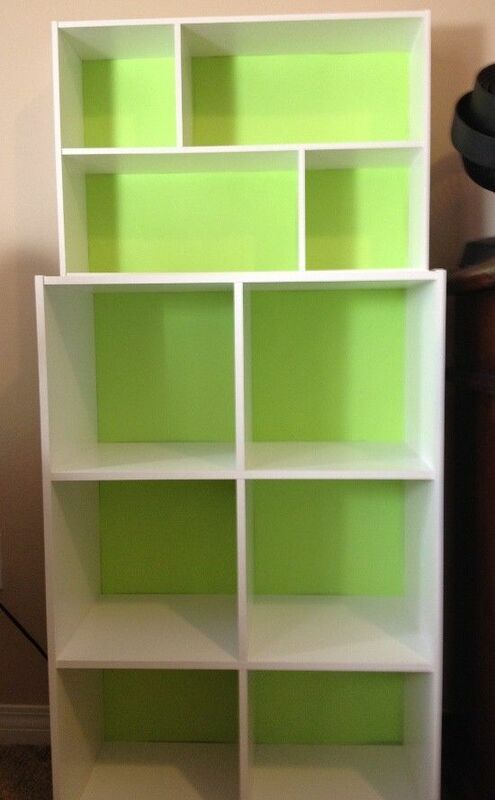 There I found some relatively cheap (compared to furniture you don’t assemble yourself) modular white shelving, and that gave me an idea: why not add the green myself, and transform a boring modular piece into a show piece? I bought a couple of pieces from their Closetmaid modular collection. You can use any kind of backless shelving you want for this project. 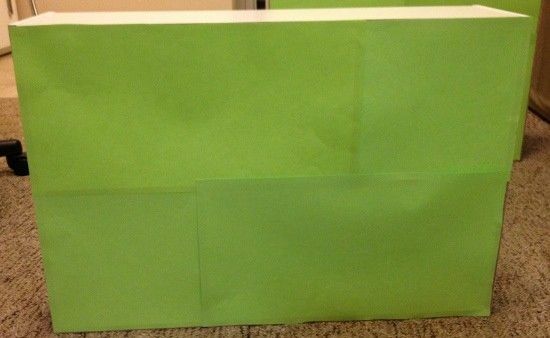 Then I went to an art store and found some heavy-duty construction paper in the exact shade of green I wanted for the backs of the shelves. 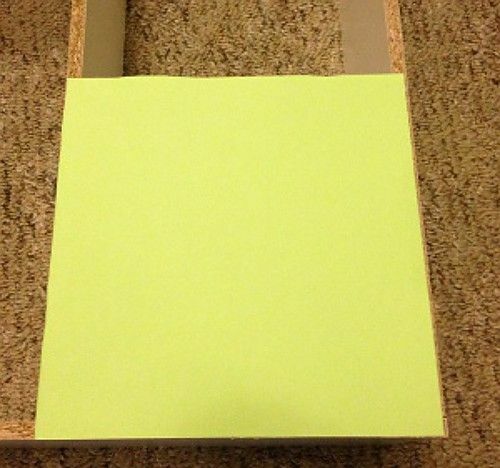 Remember: the color you pick for the backing will look slightly darker inside the shelf, because of shadows. I put the two furniture pieces together first. They were fairly easy – ironically, the smaller piece was more of a chore than the large one. Pictured here: a small unit designed to hang on the wall or stand alone. I put it on top of a larger 6-cube unit. Now, let’s talk about the backing. I used heavy duty paper, which is still on the flimsy because it was quick and easy, and I didn’t need the backing to be very strong. Plus, I may change the backing to another color periodically. But if you want something more strong and/or permanent, you have a number of options. 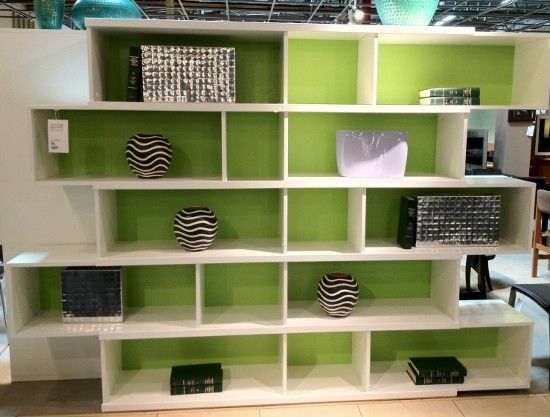 You could but shelving that has a back and just paint the interior back of each shelf. Or you could paint a sturdy piece of board and nail that to the back. it’s really not rocket science! First, I cut my paper to the size of each cube or section of shelving, so there would be no visible paper seams. To apply the paper backing, I used double-sided tape. You could also use glue or tacks of some sort. I found it was better to apply the tape to the shelf first and then put the paper down over it. 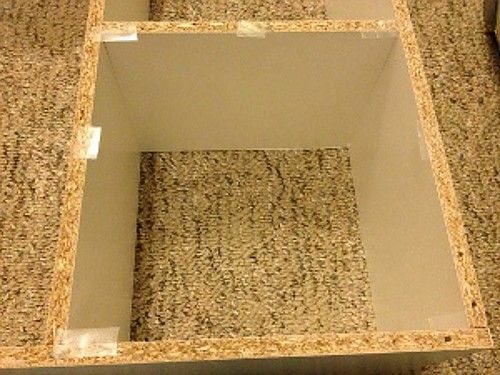 In the picture to the right, you see the back of the shelf with pieces of tape on the corners and edges of one of the cubes. Then I laid the paper over it and pressed it to the tape. Then I did the same with every other cube. 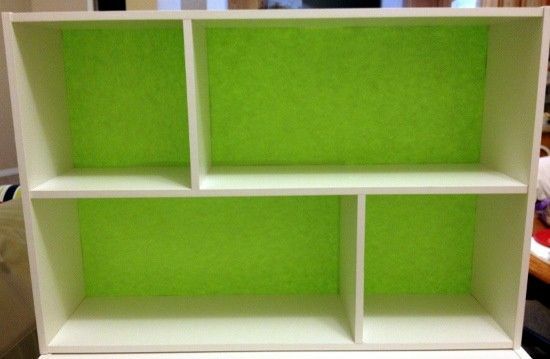 Here’s an image of that shelving unit with the back totally covered in the green paper. Note the overlapping edges of the pieces of paper I used. Overlapping the edges makes it easier to get each piece to stick well and gives you added insurance that it will stay stuck. This was a super simple and quick project, and I love how it turned out! 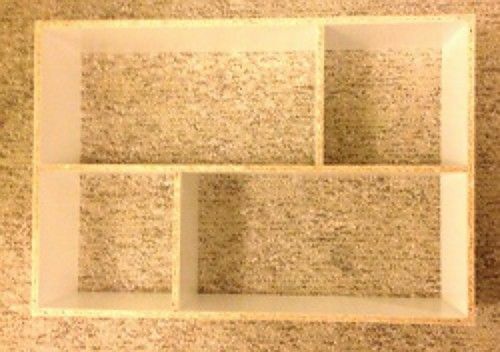 The cost of the shelving units and paper together came to less than $70, but it looks like it could have cost a lot more.